This centre is accommodating and highly adaptable, with meeting rooms, conference facilities, and training rooms. There is high-speed Wi-Fi provided, and the floor plans are flexible for businesses of any type. The surrounding area is highly commutable, with lots of road links within close proximity. There are also public transport links within reach so your visitors never have to travel far to reach the space. 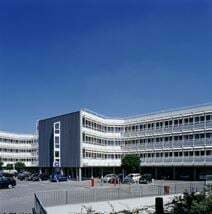 Located in the business district of Mainz, this business centre offers offices and meeting rooms, furnished to a high standard and equipped with state-of-the-art technology. The administrative support ensures your business runs efficiently, whilst the IT support keeps your systems connected throughout the day. This professional working environment will enhance the image of your company. Served by numerous public transport routes, this business district hosts numerous companies and offices.